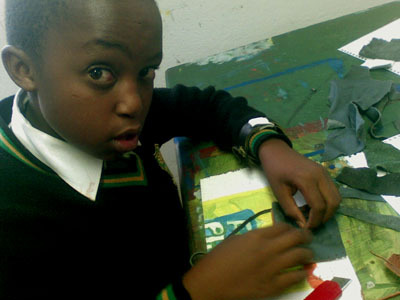 St Martin de Porres High School, in Gauteng Province, South Africa, was the first South African High School to introduce Room 13. The learners took ownership of this project from the start, cleaning and making safe the room that would become their studio. Many of them were former students of Sapebuso Primary School, so to set up a Room 13 in High School was a natural progression. Room 13 St Martin de Porres opened in January 2008. The studio quickly developed a high profile within the community. The studio operates as a community interest company that produces high-quality arts and crafts by design or commission, does sign making, advertising and t-shirt printing, and takes part in cultural festivals and events. 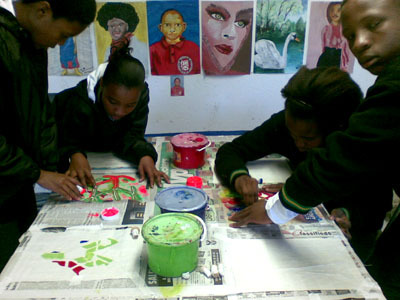 The young artists work hard to promote their work to galleries and museums, and will take any opportunity to exhibit and perform. 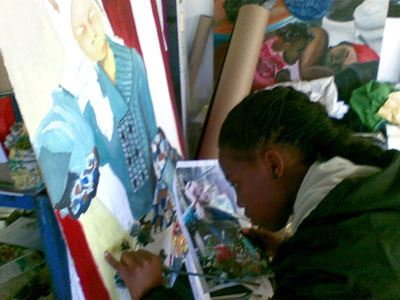 In the studio, learners are motivated to develop their skills through a rigorous programme of work. They must demonstrate commitment by attendance and making regular progress. Poetry sessions at Room 13 St Martin de Porres every Thursday afternoon draw large crowds as many young lyricists gather to participate and perform their work. Students operate a rota to share responsibility for cleaning and managing the studio, and have established a timetable to ensure fair access for all learners who choose to be involved.